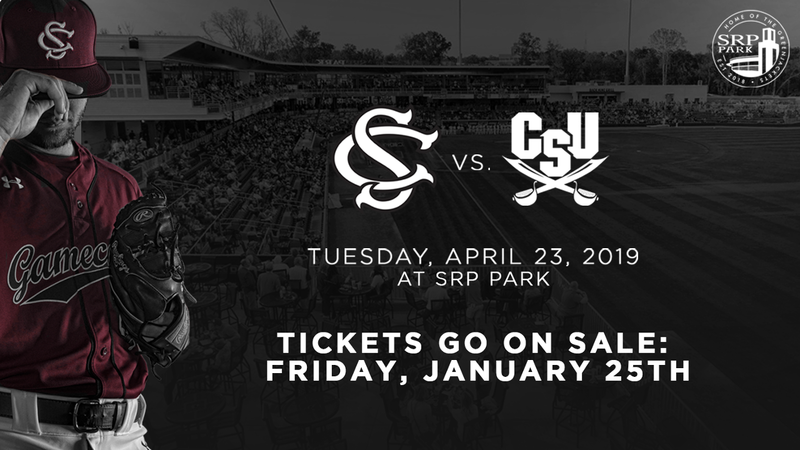 NORTH AUGUSTA, SC: The Augusta GreenJackets, South Atlantic League affiliate of the San Francisco Giants, in partnership with the University of South Carolina, are excited to announce that on Tuesday, April 23rd, the University of South Carolina will host Charleston Southern University at SRP Park with first pitch slated for 7:05PM. Individual tickets go on-sale to the general public at the SRP Park Box Office (187 Railroad Ave, North Augusta) on Friday, January 25th at 9AM. Fans who would like to purchase online will be able to starting at 10AM. There will be NO phone orders for the Charleston Southern v. South Carolina Game. "We are excited to play in a great stadium in front of our fans in the CSRA." Head coach Mark Kingston said. "This gives our supporters in the CSRA a great opportunity to see the Gamecocks in their backyard as well as gives our players another first-class venue to play in. We look forward to heading to SRP Park in April." The GreenJackets & the University of South Carolina will open VIP ticket sales to GreenJackets Season Seat Holders, Sponsors & both University of South Carolina and Charleston Southern University Booster Clubs on Tuesday, January 22nd through Thursday, January 24th at midnight. University of South Carolina and Charleston Southern University Booster Club members will receive correspondence from their respective schools. "We are excited to welcome Gamecock Nation and Charleston Southern to SRP Park for a great night on the River," stated Tom Denlinger, GreenJackets Vice President. "We look forward to packing SRP Park and making this an annual event." VIP Sales do not guarantee your GreenJackets Season Seat location. Individual ticket sales go on-sale to the general public at the SRP Park Box Office (187 Railroad Ave, North Augusta) on Friday, January 25th at 9AM. Fans who would like to purchase online at www.greenjacketsbaseball.com will be able to starting at 10AM. There will be NO phone orders for the Charleston Southern v. South Carolina Game. Parking for the Charleston Southern v. South Carolina game will be $5 and available in the Blue Lot. If you have any questions about your reservation or would like more information on the VIP Ticket Sales process, you can email info@greenjacketsbaseball.com. The University of South Carolina is a globally recognized, high-impact research university committed to a superior student experience and dedicated to innovation in learning, research and community engagement. Founded in 1801, the university offers more than 350 degree programs and is the state's only top-tier Carnegie Foundation research institution. More than 50,000 students are enrolled at one of 14 locations throughout the state, including the research campus in Columbia. With 47 nationally ranked academic programs including top-ranked programs in international business, the nation's best honors college and distinguished programs in engineering, law, medicine, public health and the arts, the university is helping to build healthier, more educated communities in South Carolina and around the world.